Had Patrick over last night. 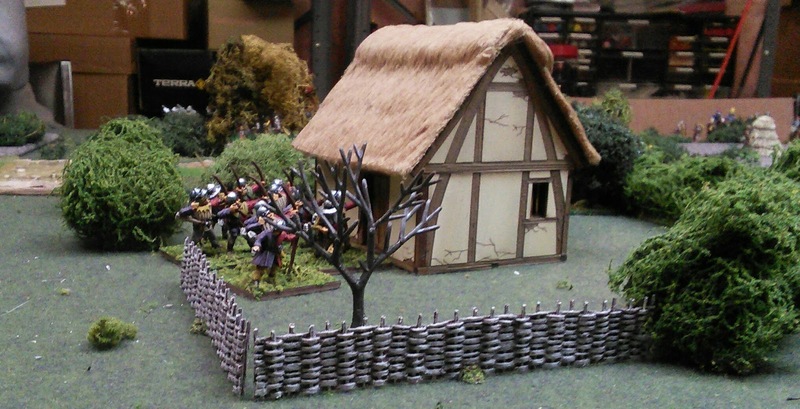 I decided on Lion Rampant because I was in the mood to set up a goodly pile of my mediaeval terrain. I decided to do something bigger too, to try some new troop types and also how the game would flow. 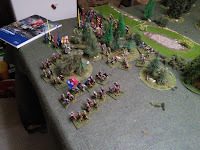 So from my late mediaeval collection I was able to build two retinues of French to fight an alliance of English and Burgundian retinues. 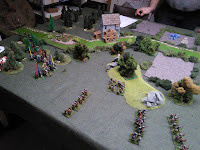 I took the retinues from the back of the book, except the English and Burgundian Men-at-Arms were mounted being on chavauchee, and for the French their crossbow units were both equipped with pavises because that's what I have. 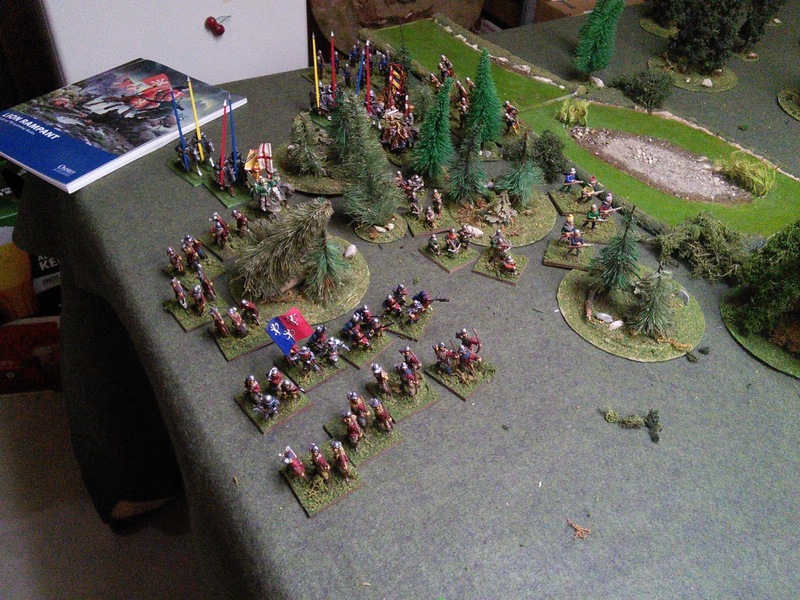 One unit of French Mounted Sergeants was armed with crossbows too, again due to collection limitations. 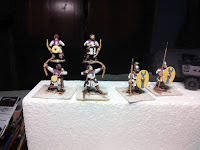 I am lacking in lighter Sergeants, Hobilars or Coustilier type figures. 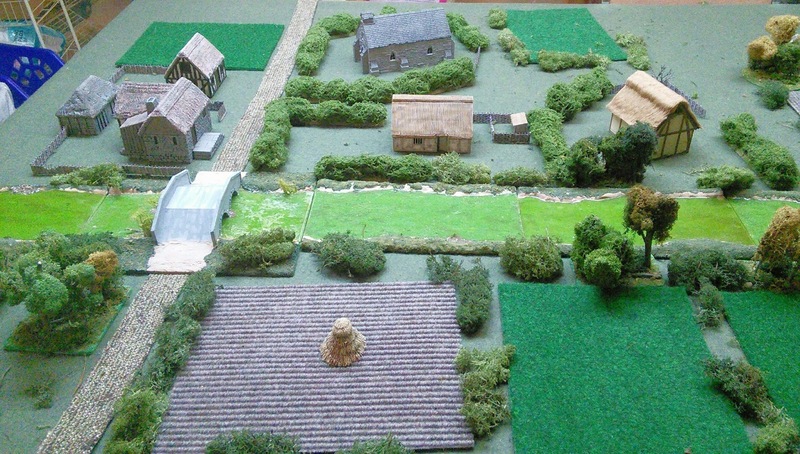 Liberal usage of lichen to dress things up helped soften the edges of fields etc. 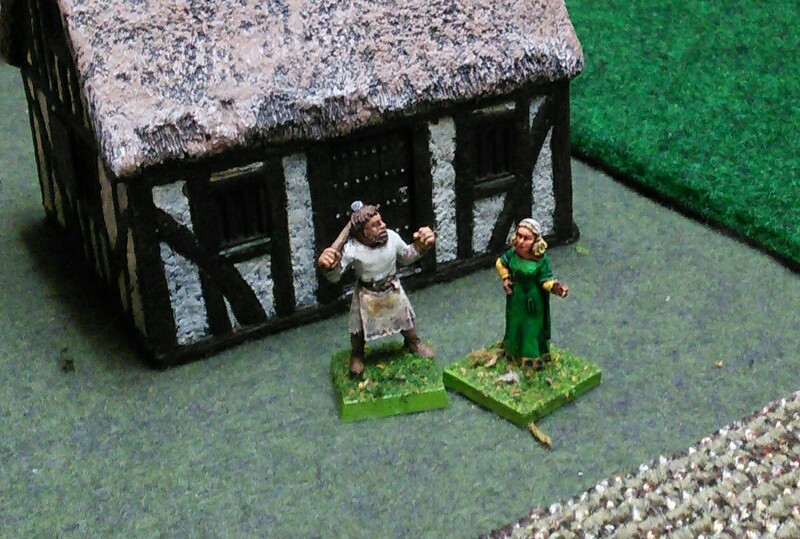 "Oo, Edith did you hear about Stephane and Marie?" 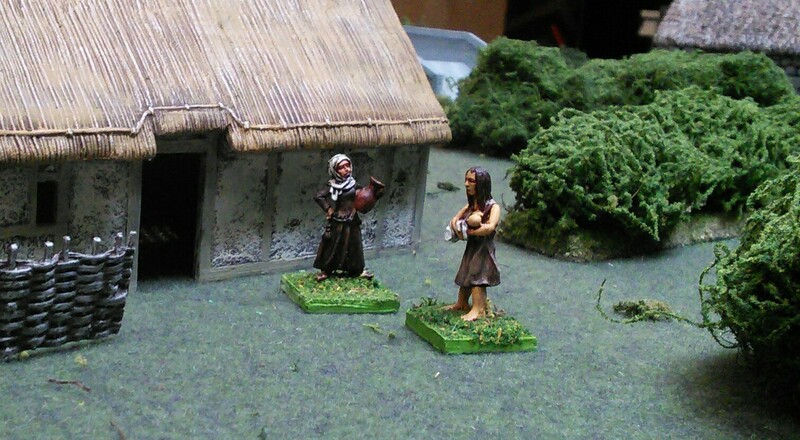 "I don't suppose this lot will help get the harvest in?" 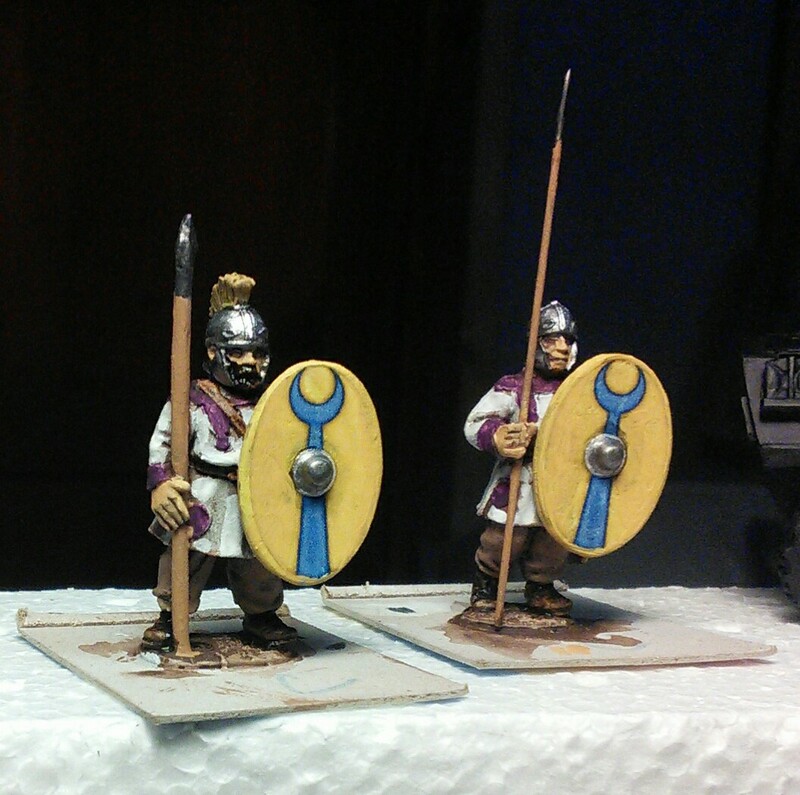 I really ought to finish painting my Miller figure. I made the river fordable at the sandy island. 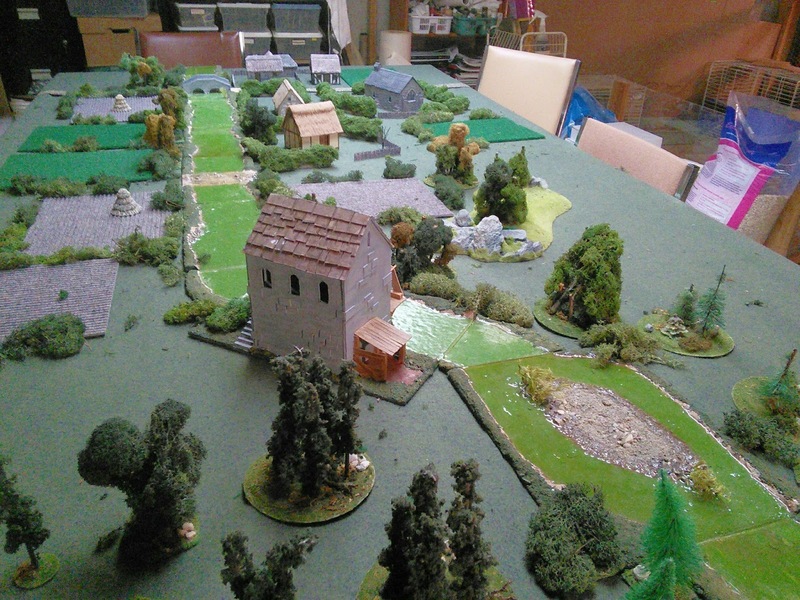 Armies started in opposite corners with the Anglo-Burgundian force wanting to burn the village. 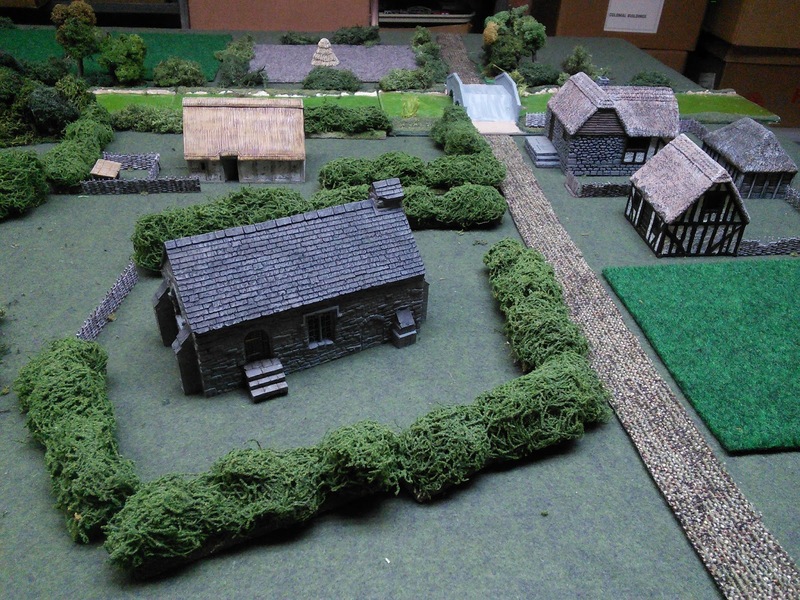 The Goddons swarmed out of the woods and pushed towards the village. 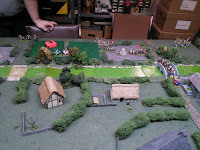 The Burgundian retinue detached the unit of bidets (skirmishing handgunners in this instance) and some archers across the river to burn the Mill. The crossbows got despatched to hold the central ford and protect the flank. 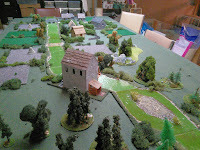 Meanwhile the French sent one retinue into the village and one towards the Mill. 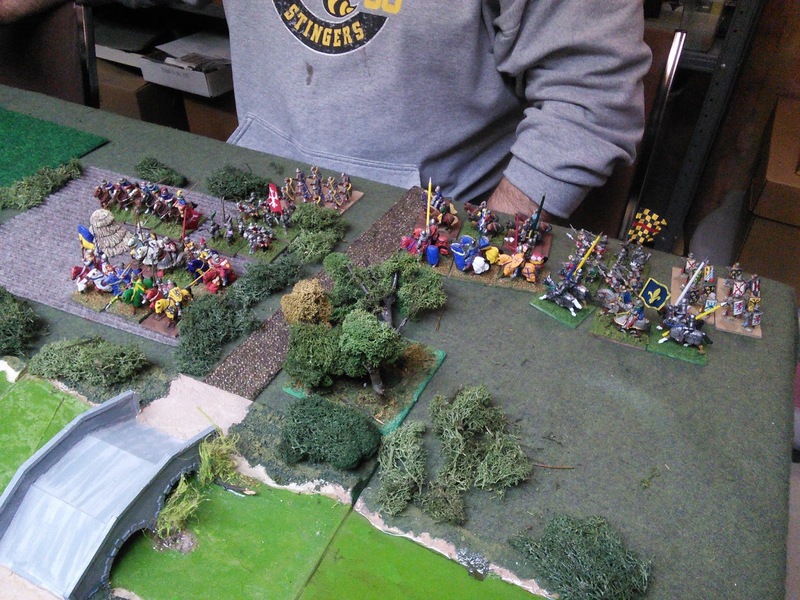 The retinue crossing the bridge promptly stalled at the tavern for several turns. 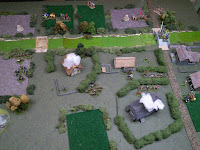 The other force saw the Mounted sergeants thunder off to the mill while the rest marched fitfully through the fields. 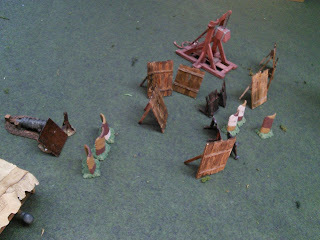 Unsupported, the sergeants delayed the Burgundian arson but eventually succumbed to archery. The English also became equally strung out due to failed activation rolls. The Burgundian crossbows at the ford engaged in a firefight with the French crossbows across the river. Despite the pavises on the French and low activation roll for crossbows, my troops seemed to be belt fed and thoroughly shot up the French, driving them back from the river several times. Meanwhile, English and French troops were entering the village. 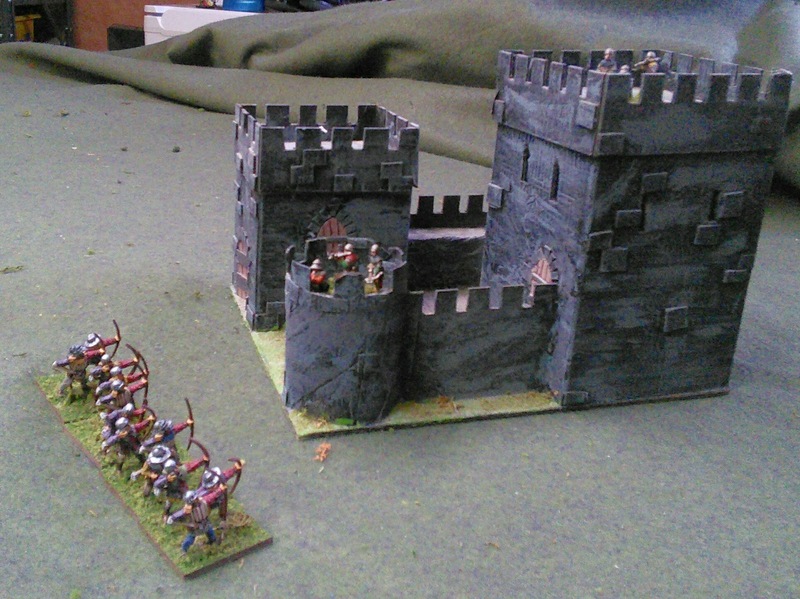 One unit of longbows seemed to have forgotten their flints and took a long time to set a cottage on fire. 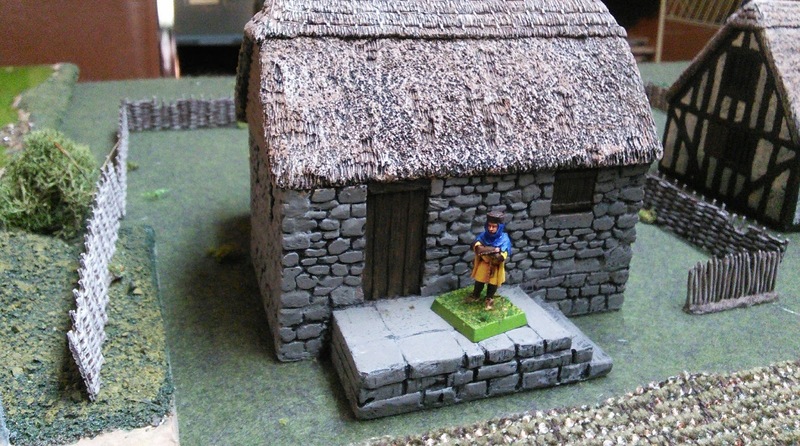 "'Er now Bert, you was supposed to bring the flints!" 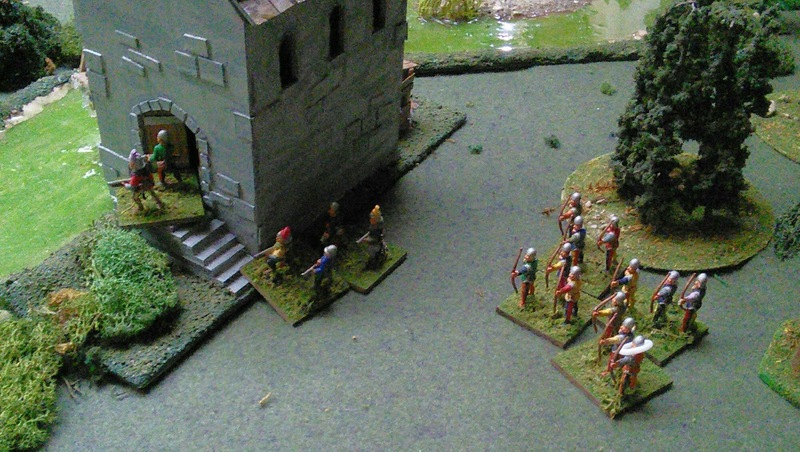 The English and French chivalry now faced off on the edge of the village beside the church. 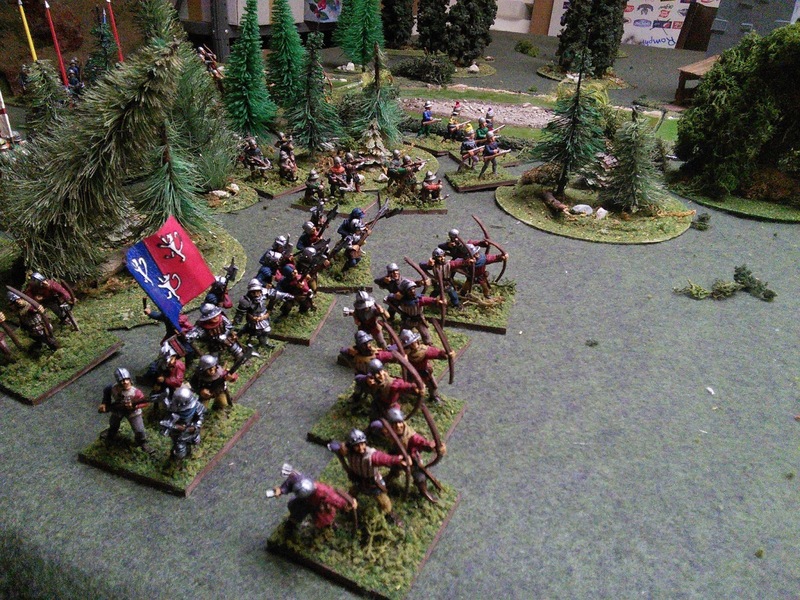 I brought another unit of longbows up to support, but the "Wild Charge" rule had my knights crashing ahead without waiting. Patrick kept failing his counter change rolls, so I bundled his knights back, destroying them in a few turns of melee. 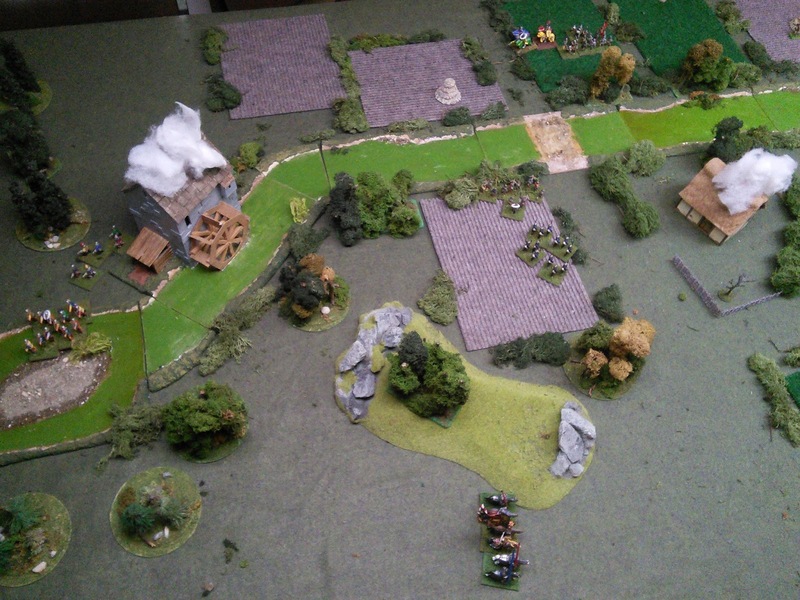 The French mounted crossbows clattered down the lane on the other side of the church to be met by my Expert sergeants, who decided to get stuck in rather than let the French shoot. "Ooo look Edith, ain't they handsome!" 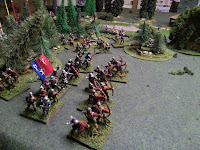 Without any support or room to move the light cavalry were destroyed by the English billmen. The French sergeants pushed up the laneway next to engage the English billmen. 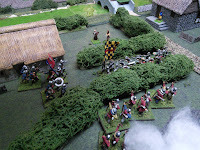 English archers then entered the church yard and quickly looted and burned the church so they could line the hedge to flank the French. At this stage Patrick conceded the game. Considering the size I thought the game rolled along nicely. The activation rolls add a nice bit of friction and uncertainty. 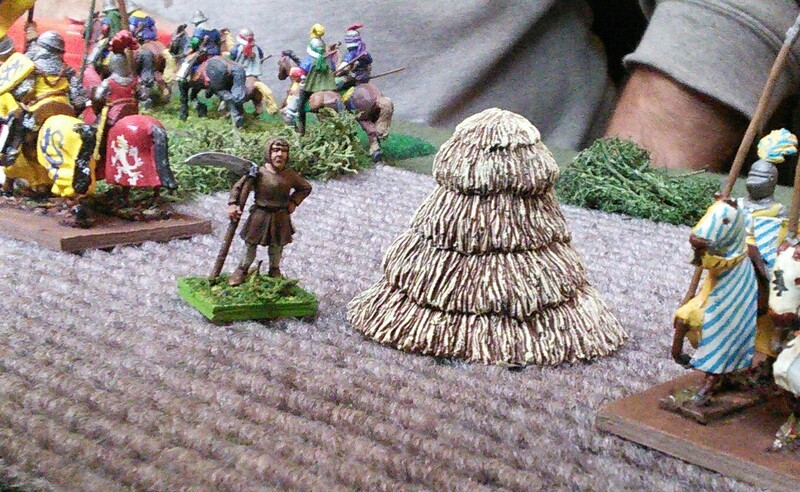 I have also suspended my prejudice against rules with set unit sizes. It does aid in the simplicity. 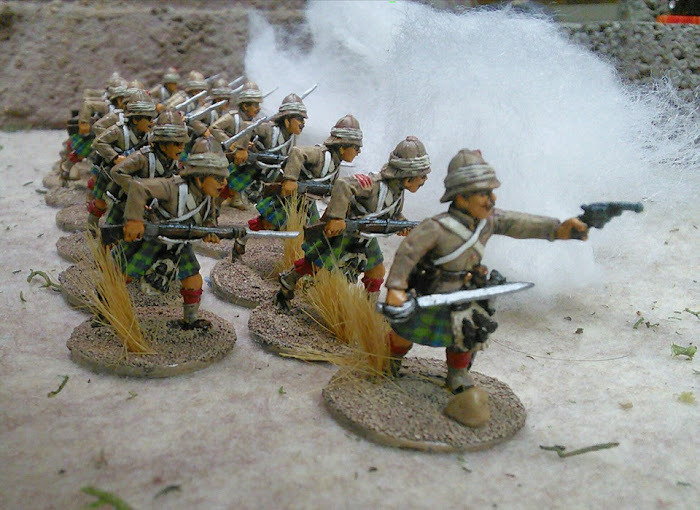 Although the observant among you will notice that my foot sergeants are 16 figure units, not 12. I had been getting out my archers and just naturally grabbed 4 stand units forgetting to count the figures, but it didn't cause problems, just a bit of math. I did forget to add in some chivalric boasts though which might have added more flavour. 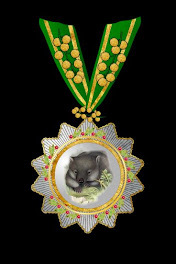 Although I'm not sure if the French would have achieved any. Bit of a slow week. Some painting with Mikey last night and some solo hanging out with Biggles tonight. Working on two 12 figure units of auxilia for my friend's Late Roman army and today's mild weather meant I could get some more vehicles for my Canadian combat team spray primed. The shield transfers are from Little Big Men Studios and are different than the usual waterslide decals I'm more used too. They are very nice but the plastic film can be hard to peel off and you don't get any chance to move them once on the shield. 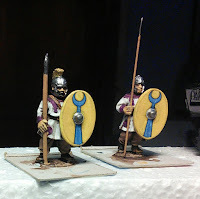 They are also translucent, so after three I decided I needed to go over the shields with another coat of white to give an even coat underneath. So I'm writing this while waiting for paint to dry at 2330 hrs. 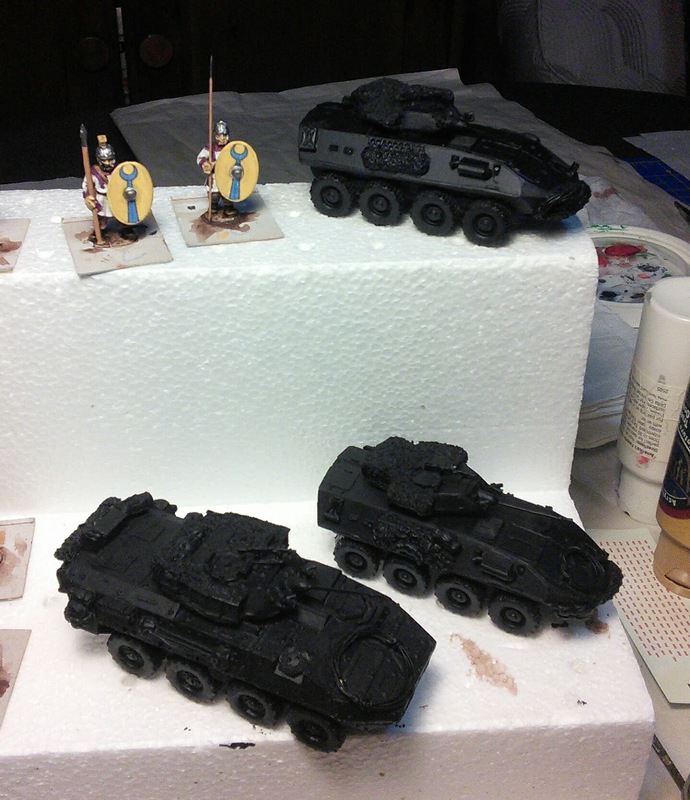 Also the transfers don't fit exactly, so you have to tidy up the edges with paint. Fortunately the Cermacoat "Empire Gold" is a perfect match for the yellow. The vehicles are a pair of Coyote Recce vehicles and a fifth LAV III to act as either a FOO, Tac HQ (in case Call Sign 0 shows up) or ride for engineering assets. Afternoons again this week, so hopefully I can get the rest of the shields done by Friday. 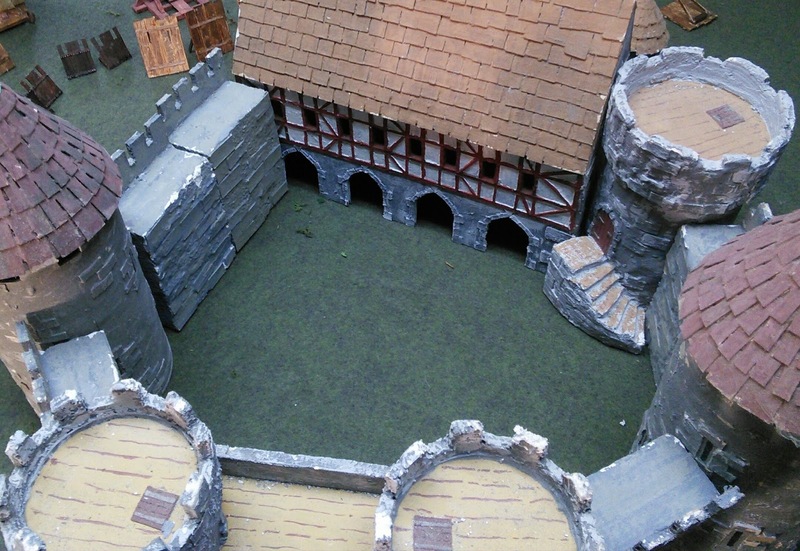 I think it is a universal truth that every medieval wargamer wants a castle. They are so iconic of the era and strategically important. Many of the battles had a castle involved somewhere. 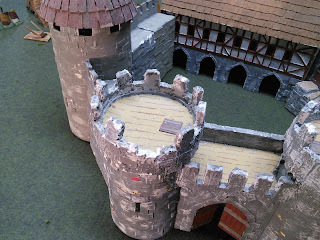 Of course most of our table top castles are inspired by the great fortresses that still survive. 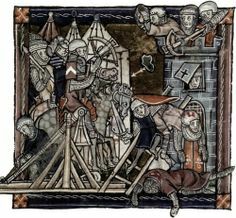 Huge structures with layer upon layer of towering crenellated walls and massive drum towers giving interlocking fields of fire making them all so strong that many were never successfully assaulted. The models of them are suitably enormous and take up most of the table space. 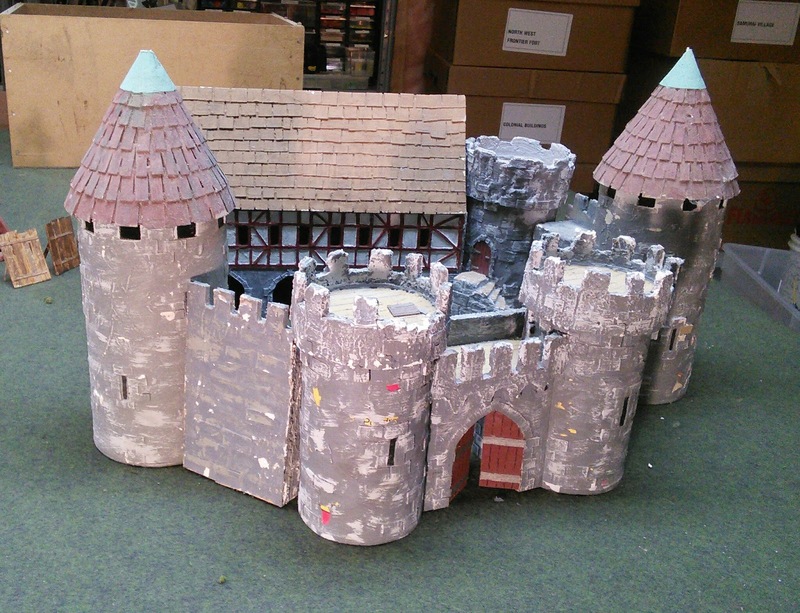 Mikey has been working on a card model of Bodiam Castle for decades. The floors in each tower will be accessible and the portcullis will work. I think he has one wall done. 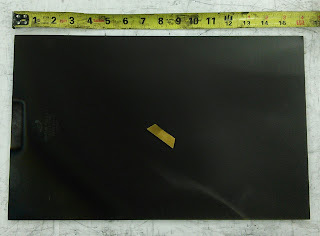 But the footprint is enormous. 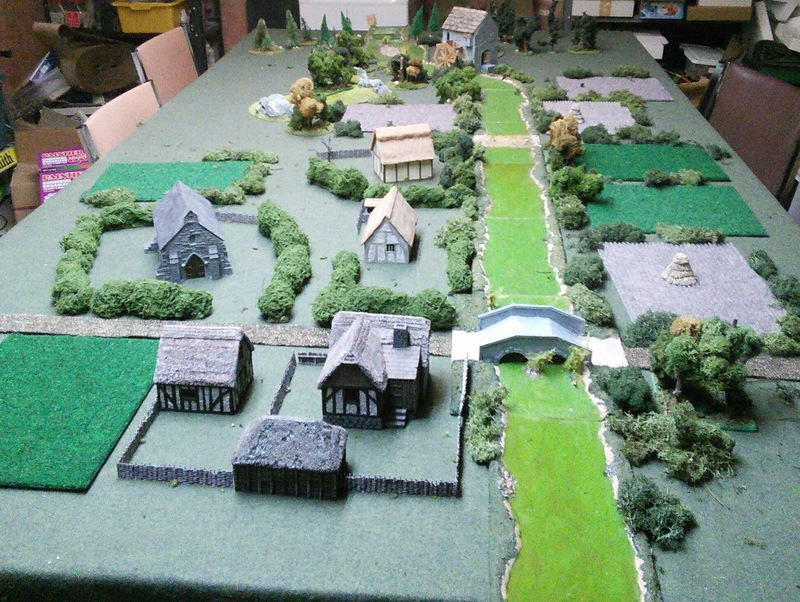 Which is OK for a 1:1 skirmish or RPG. 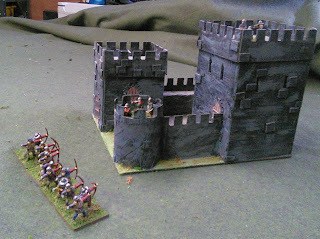 But for most rules, an archer couldn't shoot from one end of the castle to the other the model is so huge. Damn door to door salesmen! 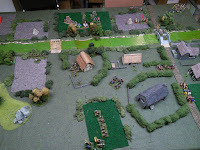 For most of our games we need something smaller which can be held by a few dozen figures while the rest of the player's army marches to their relief. 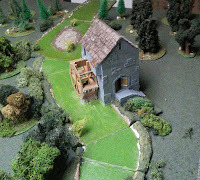 A small country castle held by a small baron which would actually be worried by a column on chavauchee burning it's way around the countryside. Something that can sit in a corner and not take up too much table space while the sortie or raid or relieving army lifting the siege occupies most of the action. 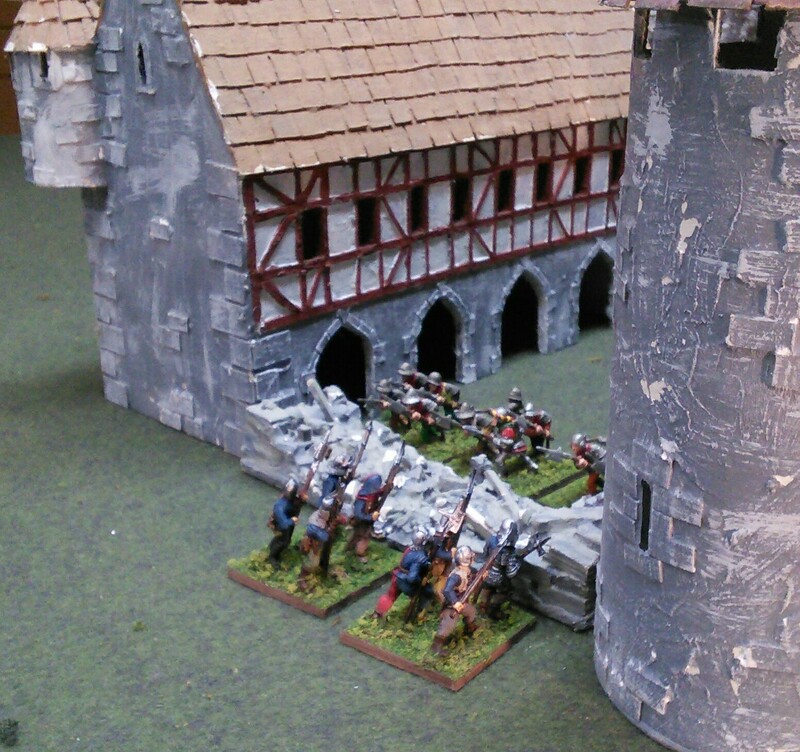 All these thoughts got me thinking of playing some Lion Rampant this weekend. 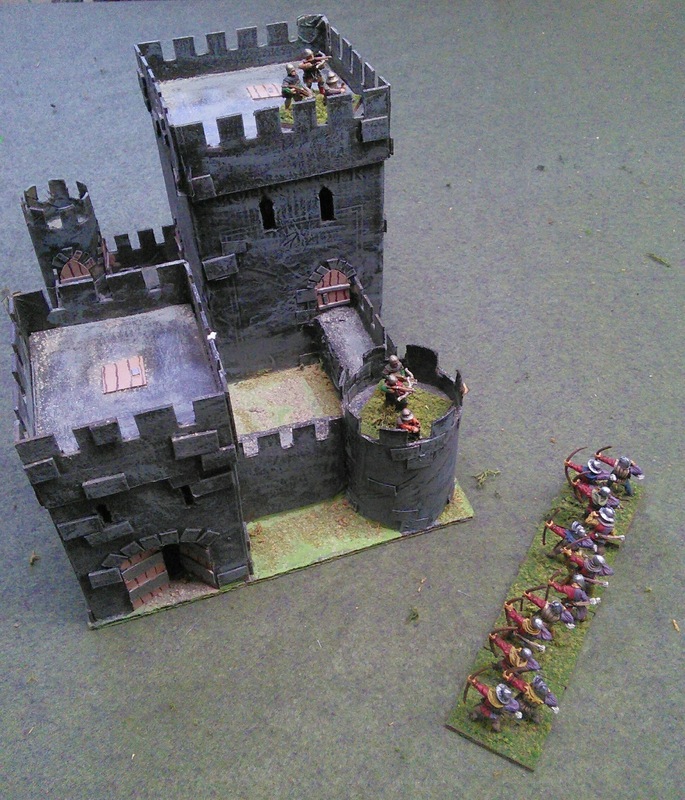 Have the garrison of a castle sortieing to raid the siege lines, meanwhile part of a relief force is raiding a supply convoy heading for the besieger's camp. Now this brings me to my castle, which has been sitting in it's box for a couple of decades. 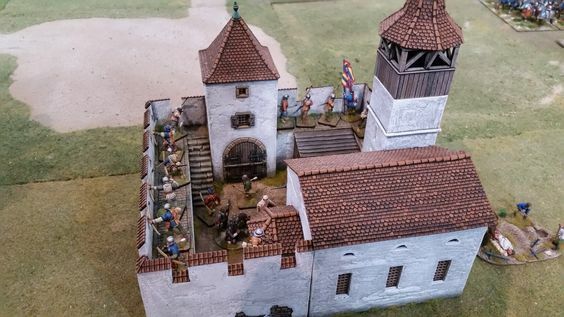 I think I made the gate house and open topped tower over thirty years ago after Mrs. Rabbitman bought me my first lead medieval figures for Christmas. The towers on the gate house are made from scrubbing powder bottles (you can see the yellow labels appearing in the chipped plaster). 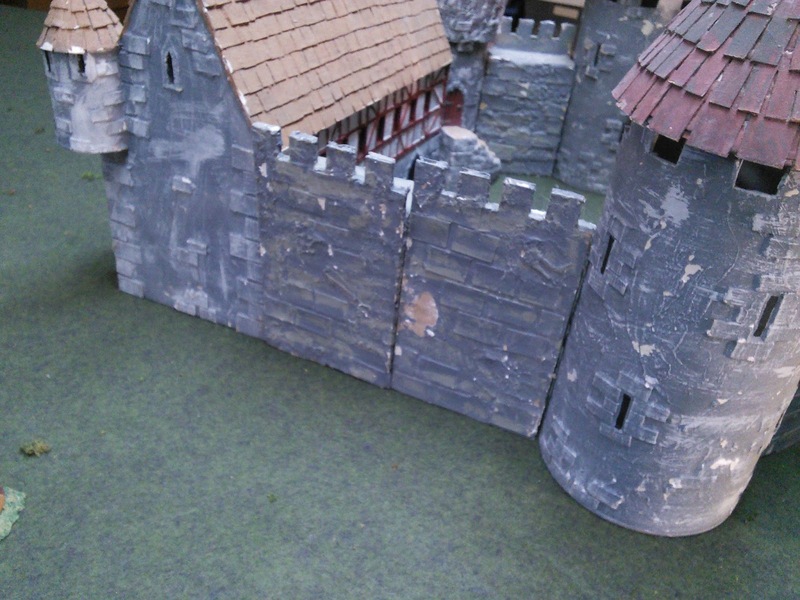 Sections of styrofoam for the crenellations. The walls are made from chunks of styrofoam with corrugated card wall stuck to the outside. The drum towers were made from cocoa tins. Everything got a goodly coat of plaster of paris and grey paint. I did at least have the idea to make everything modular. But I didn't really plan out the modules or how they would fit together, so it makes for some odd layouts, and you have to imagine doors at the towers. And there is only the one set of stairs. I'm still pleased by the Great Hall though. I think the turrets came out nicely. 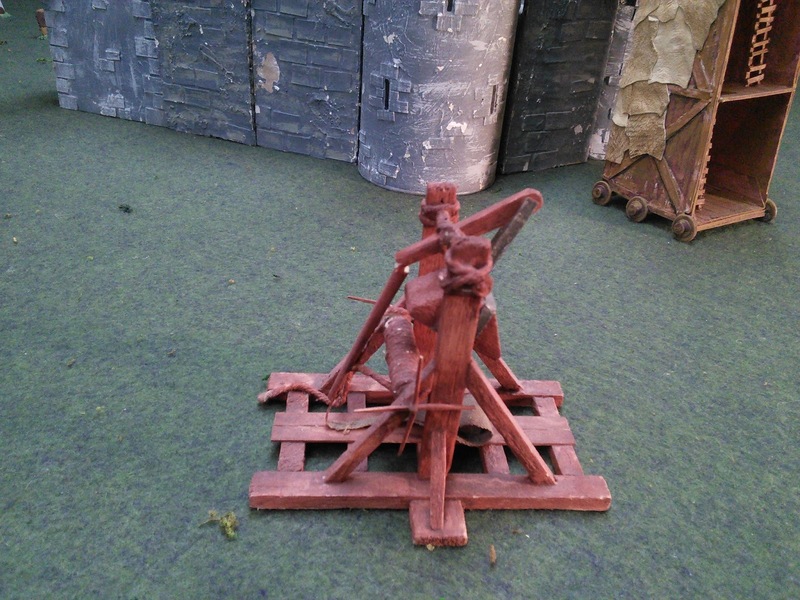 I also made siege engines naturally. The siege tower is actually my second one. Mrs. Rabbitman had some left over leather from teddy bear paws and donated it to the cause. I think it's quite effective for the wet hides. It is however a shame I didn't think to measure the height of the bloody walls! 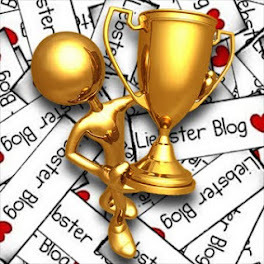 "Oh oh! We're going to have to jump!" 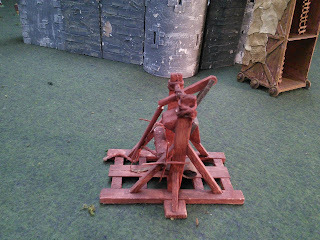 I remember knocking these trebuchets together when Daughter Number 1 was a baby, inspired by the elastic band powered catapults my dad made for me which fired balls of cigarette foil at my Airfix figures. I have at least assembled a collection of resin, metal and hand made with coffee stirrers mantlets, which will look better after a redo on the paint I think. Plus a trio of bombards, which not being suitable for field battles haven't been out of the box for decades either. 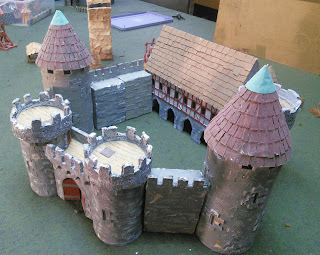 When Daughter Number 1 got bigger she wanted to have her own castle to house her small band of dwarf warriors, so we built this one together. This I think, is more of the size I am really aiming for. And maybe I shouldn't bother with it being modular either. Just a nice piece that can be garrisoned by a couple of units. 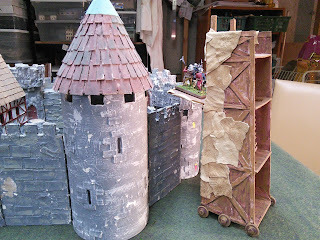 Making the castle as a set piece, perhaps scaled to fit in a box to keep the dust off, I could incorporate a rocky outcrop to put the keep on and a moat in front of the bailey. Obviously my current castle and siege equipment are not quite the thing and in need of an upgrade. So I should keep an eye out for opportunities for siege engines, entrenchments etc. and start brainstorming the layout of a small castle. More to add to the project list it seems. Well my straight days has come to an end. 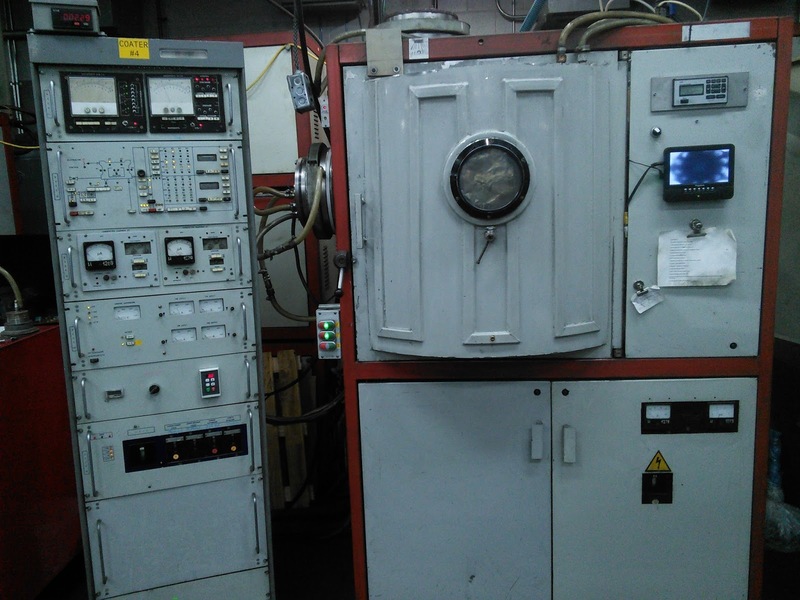 Last week, the 70-something fellow running the coating machines announced (quite reasonably) that he was retiring. I was asked to take over his spot. I gave a resounding "Hell no!" to straight afternoons, but the lure of a raise and the offer of alternating shifts with the day guy got a firm "Let me talk to Mrs Rabbitman." So this week I find myself working 10 hour shifts learning how to use old Russian equipment, faith and science to coat machined pieces of steel. The machines, being second hand, are each subtly different. And they are all McGyvered together with solder and hope. And being Russian, the controls are in, well, Russian. 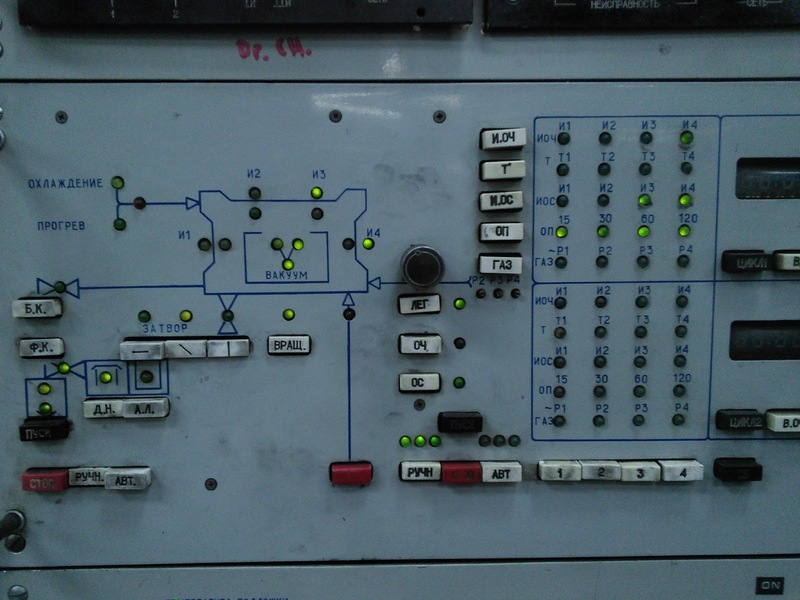 To my surprise those lights and dials are actually beginning to make sense to me. 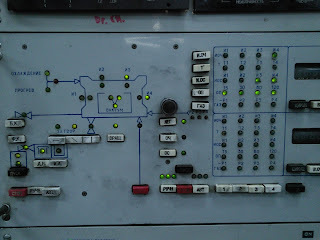 At least the lights and dials that still work. 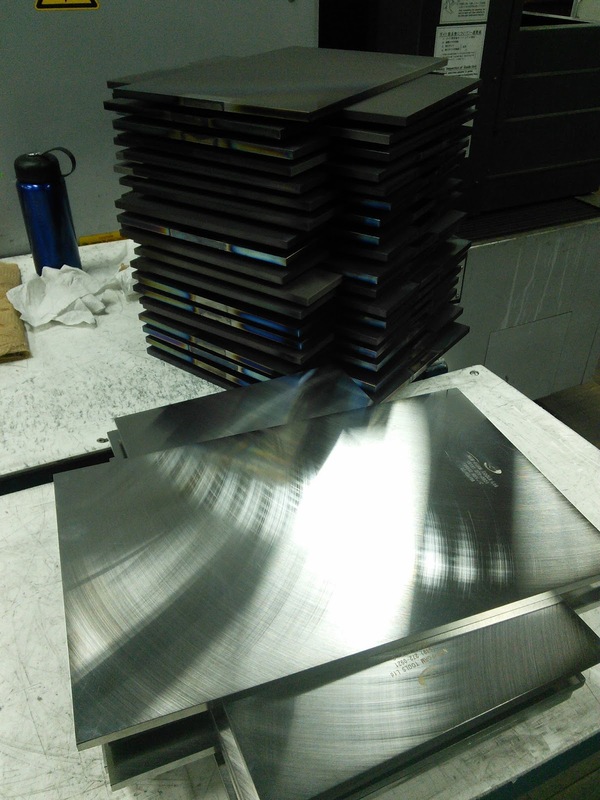 The blades come in various sizes from tiny to 9 kg. 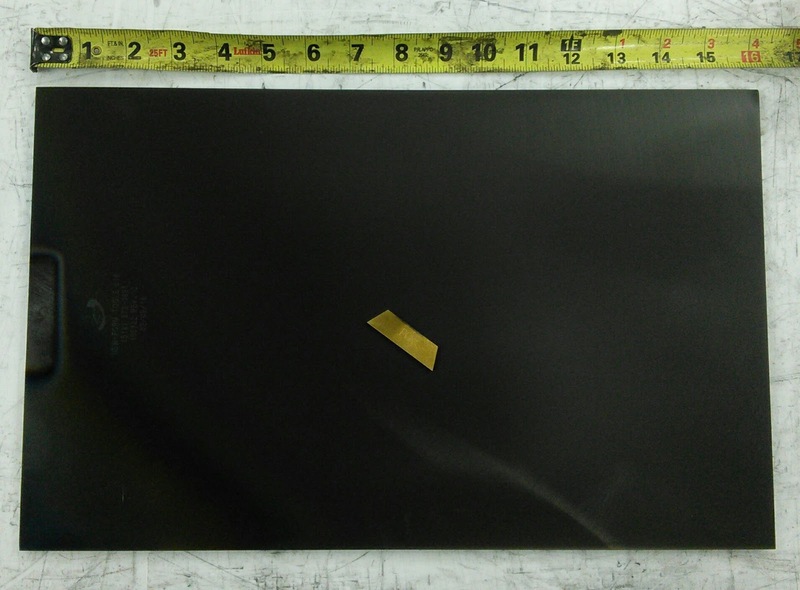 The gold is a coating of titanium nitride and the black blade is coated with aluminium oxide over a layer of titanium nitride. Yes, I put on a mask when vacuuming out the vacuum chambers before reloading. But punching out at 0200 hours and being back in for 1530 hours means the hours of wakefulness are mostly spent drinking tea and eating. A three day weekend every other week will be a good thing however, and this weekend there is a holiday Monday here in Ontario, so extra bonus. 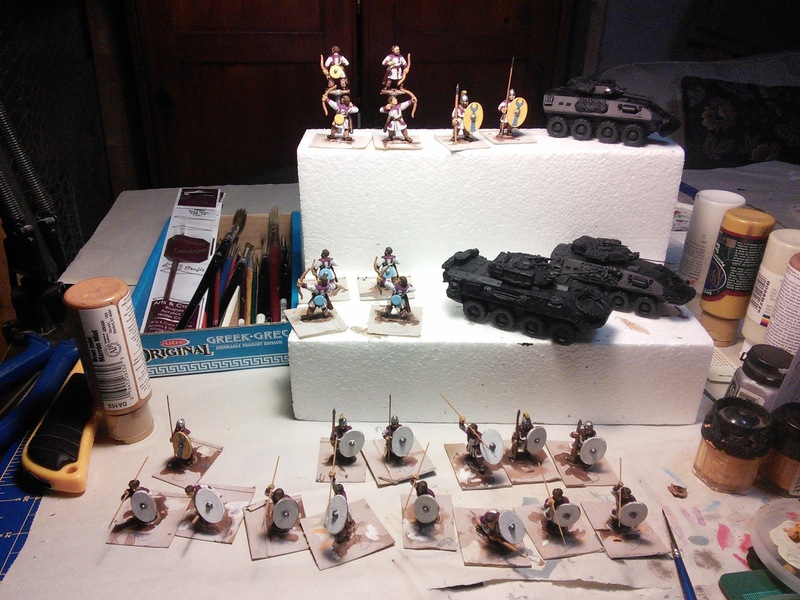 So every other week is going to be a wash for painting however, just when I was resolving to spend more time at my painting table. Last week was also a painting washout due to fatigue, Hotlead prep and prep for a navigation FTX this past weekend with the cadets. But no longer being the utility guy who is trying to keep (and look) busy will be another good thing.